Last month I covered the where and when of the fall mullet run. I’m going to assume you have that part down so we’ll get right into how to catch fish during the mullet run. I think a whole book could be written about this subject and plenty of rigs and methods work. I’ll just cover the techniques I use the most. I by far throw topwater plugs more than anything during the mullet run. I love the surface strike and some of the hits you get are explosions, what my friends and I like to call, “cinder blocks falling out of the sky” hits. I use big topwaters like the Super Spook XT, Williamson Surface Pro and Bass Pro Shops Offshore Angler Pencil Popper. 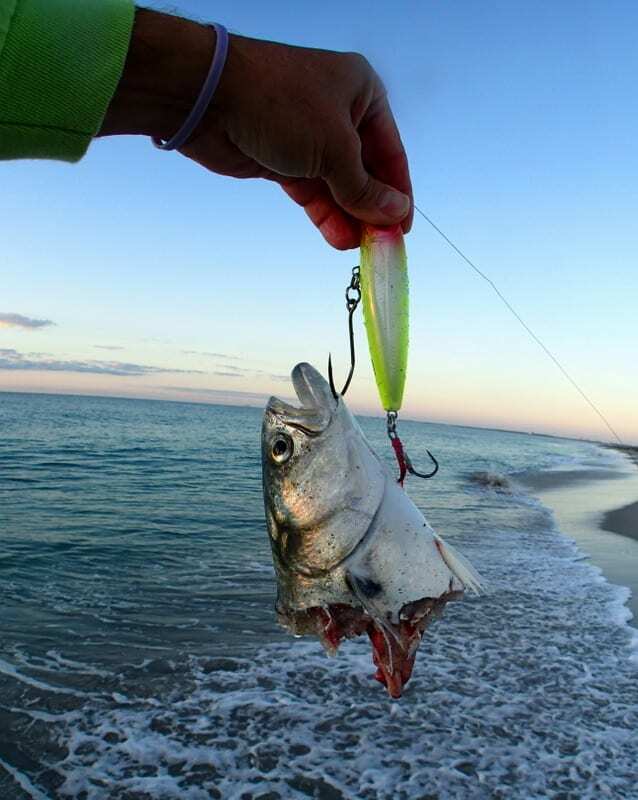 The common theme among these lures is they are built strong for heavy duty saltwater use. Well actually there’s one exception. Sorry Bass Pro, but I have to admit the Offshore Angler Pencil Popper comes with wimpy hooks. You need to replace the rear hook with something beefy, like a 2/0 Daiichi 7x D98Q treble hook. I remove the front treble hook from all these lures. 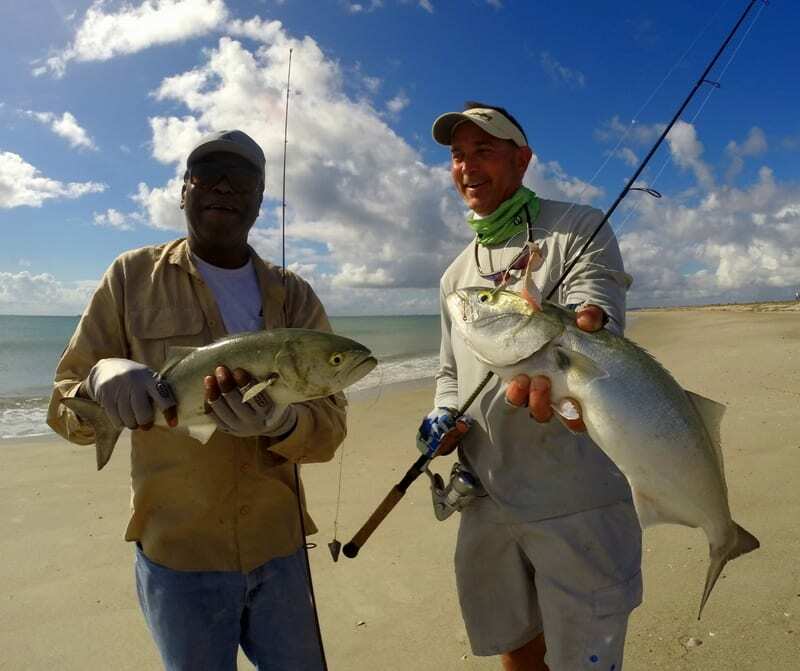 If I am fishing strictly for bluefish, jacks, ladyfish, mackerel and other such fish, I use a lure with just the rear treble. This makes it easier to unhook fish because the body of the lure makes a convenient handle to control a flopping fish. 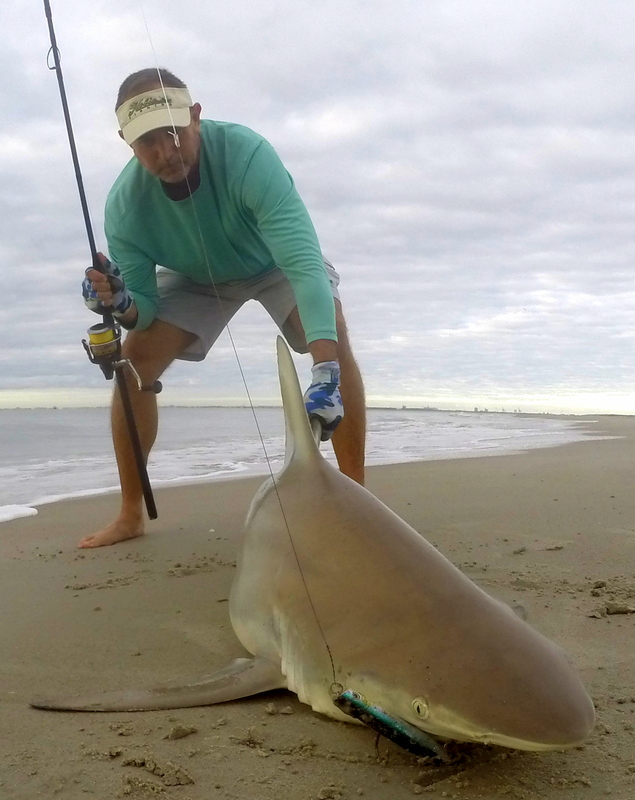 If I want a shot at catching the blacktip and spinner sharks that have a fondness for big topwaters (and I usually do) I put a big single hook like a Trokar TK8R-8/0 or 6/0 VMC ILS on the front hook hanger. On some of my plugs I’ll drill a ¼ inch hole near the head of the lure which allows the lure body to fill up with water. This provides extra heft for casting distance or for punching into a headwind and allows the lure to track better in rough surf. One lure that I’ve started using lately that I really like is the 1.5 ounce Frigg Popper from Odin Lure Company. The Frigg has a cavity in the front of the lure that Odin calls a Bait Well. You can squirt a thick, gel like fish attractant (Odin markets their own call Fish Smack) into the cavity. Gill slits on the side of the lure allow scent to leach out. I honestly don’t think the scent matters much for jacks, blues and mackerel, but it makes a huge difference if you want to target sharks. 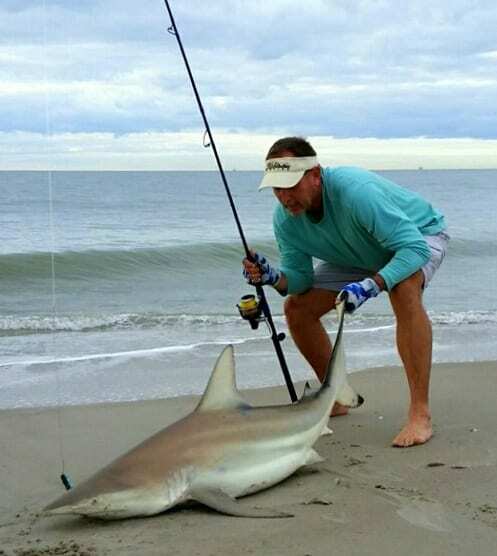 Blacktips and spinners will go nuts trying to eat a plug that gives out a little scent. After topwater, I probably throw spoon the most. 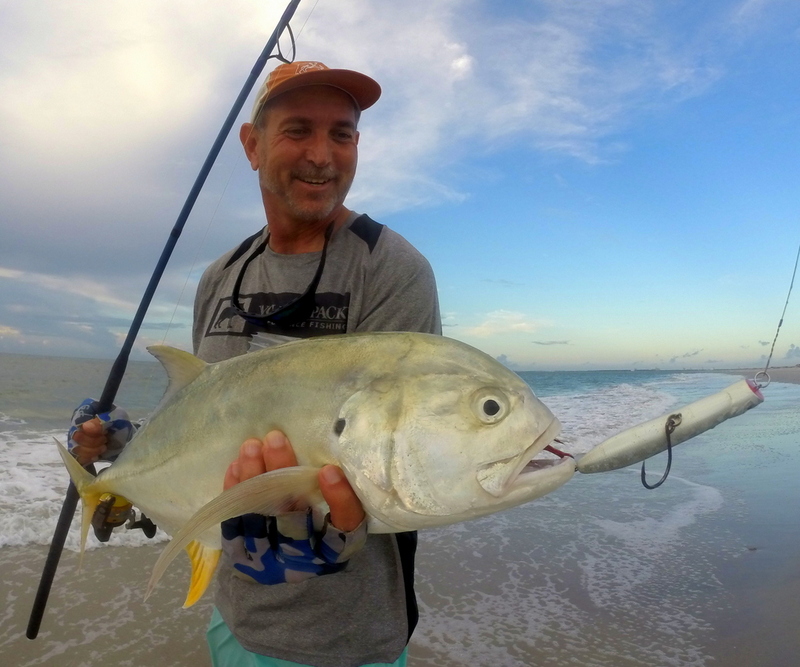 If the surf gets too rough for topwater, I’ll throw slab style spoons, two to four inches long like the Hopkins, Crippled Herring and Kastmaster. These things are nearly indestructible, cast a mile, and track well in the roughest surf. 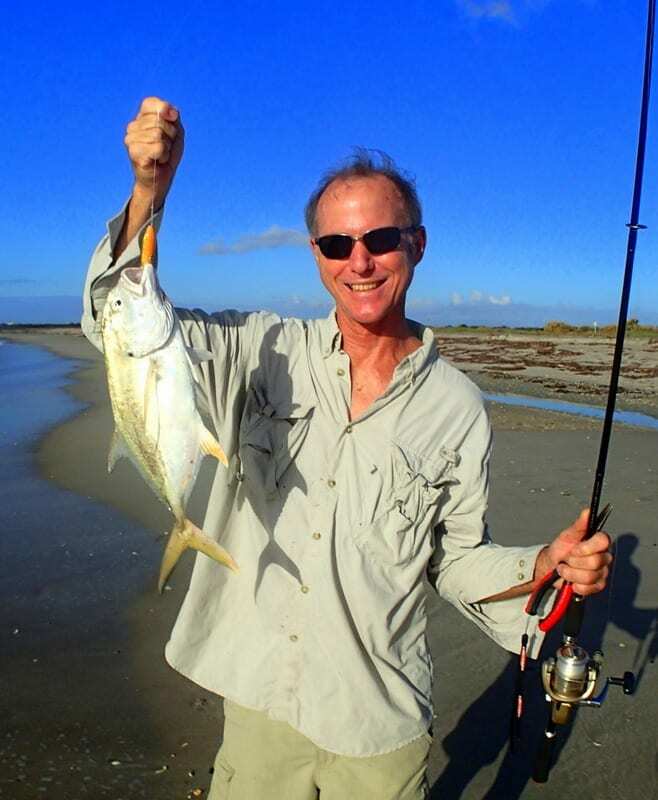 Also, most days I keep a light spinning rod handy rigged with a quarter ounce spoon so that I am ready to cast should a Spanish mackerel feeding frenzy erupt. As much as I hate to admit it, there are days when the fish are there, but the topwater bite shuts down after the sun gets high. A good way to keep the bite going is to switch to a subsurface plug. I like plugs like the Yo-Zuri Mag Darter, Daiwa Salt Pro Minnow Bullet and Rapala X-Rap Long Cast Shallow. The common theme among these lures is they don’t run deep. I don’t want a lure that plows the bottom. I should also note, when tarpon are in the surf I switch to a subsurface plug because they seem to prefer something that swims just under the surface. When I want to target redfish, snook and other gamefish in the first trough off the beach, I like to use a jig, something like a three inch D.O.A. C.A.L. Shad Tail threaded onto a ¼ or 3/8 ounce jig head. I’ll bounce the jig along the bottom if it is sandy, and work it a little faster to keep it out of the snags if fishing around rocks. I have to offer some caution though. If there are a lot of bluefish around you’ll probably not want to use jigs as they will quickly tear through your supply of plastic tails. Bait fishing is my least favorite way to fish during the mullet run but that doesn’t mean it is not the most effective. 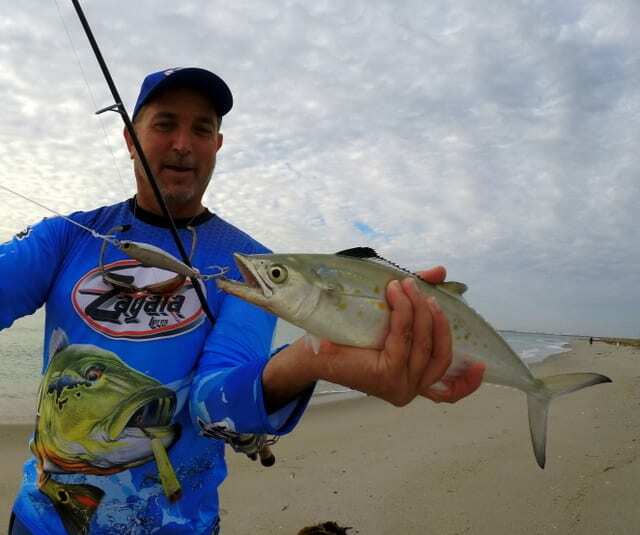 A live finger mullet pinned to a 2/0 to 5/0 Daiichi D84Z circle hook on a couple feet of 50-60 pound mono or fluorocarbon leader with a sinker just heavy of enough to hold bottom will get you plenty of action. Up to a 9/0 to 10/0 Daiichi D72Z circle hook on an 80 pound leader if you want to try free lining a full size mullet for tarpon. 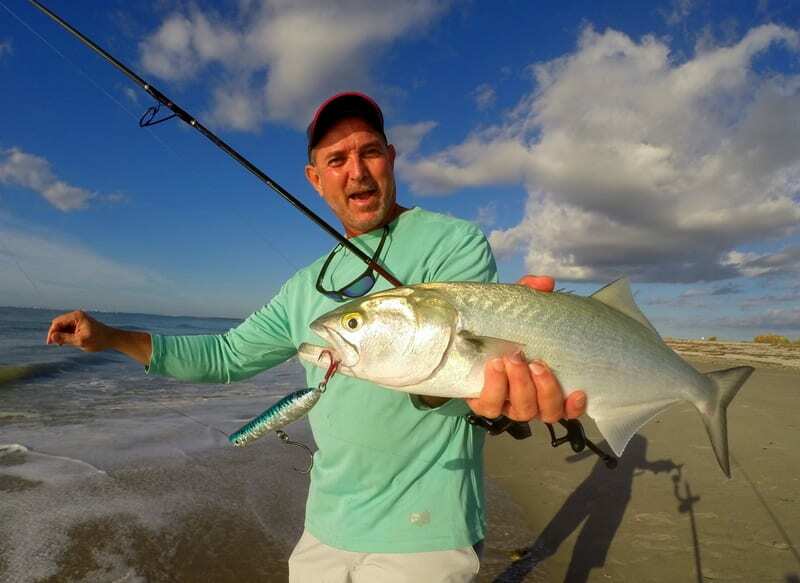 Use the same circle hooks with #9 single strand stainless steel wire leader if you want to soak big chunks of freshly caught bluefish, jack or ladyfish for sharks. Most of my mullet run fishing is done with 6000 to 7000 sized spinning reels loaded with 30 pound test Platypus Platinum Braid and mounted to nine foot surf rods like the Okuma Cedros CSX-S-902MH. 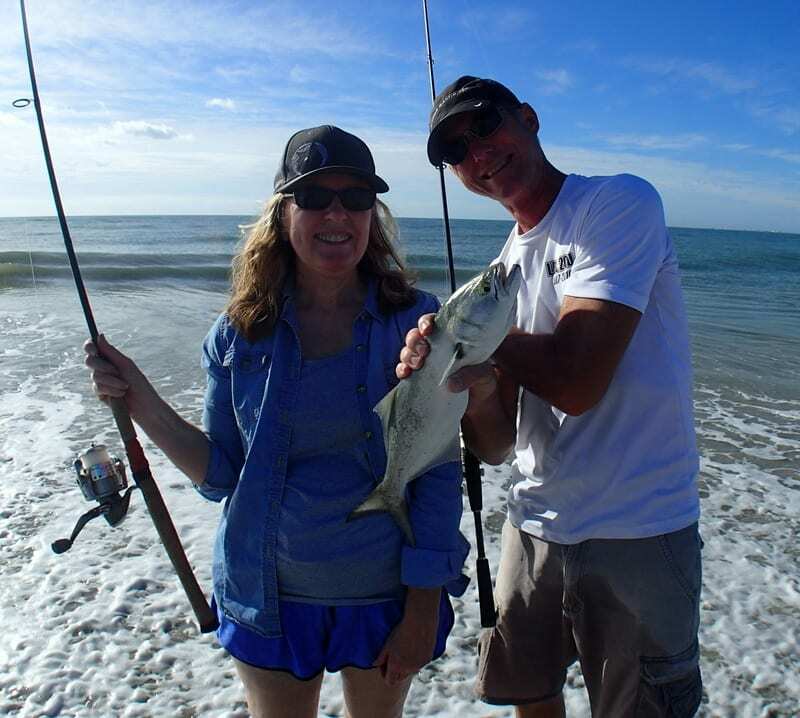 For throwing smaller spoons for mackerel and tossing jigs or finger mullet into the first trough, I use a 4000 spinning reel with 20 pound braid on a seven foot medium fast action rod like the Cadence CR5-701S-MF. I add a few feet of 50-60 pound mono or fluorocarbon leader for lure fishing and will add a couple feet of #9 wire if I want to target sharks. Like I said at the beginning of this article, these are just the techniques I use. 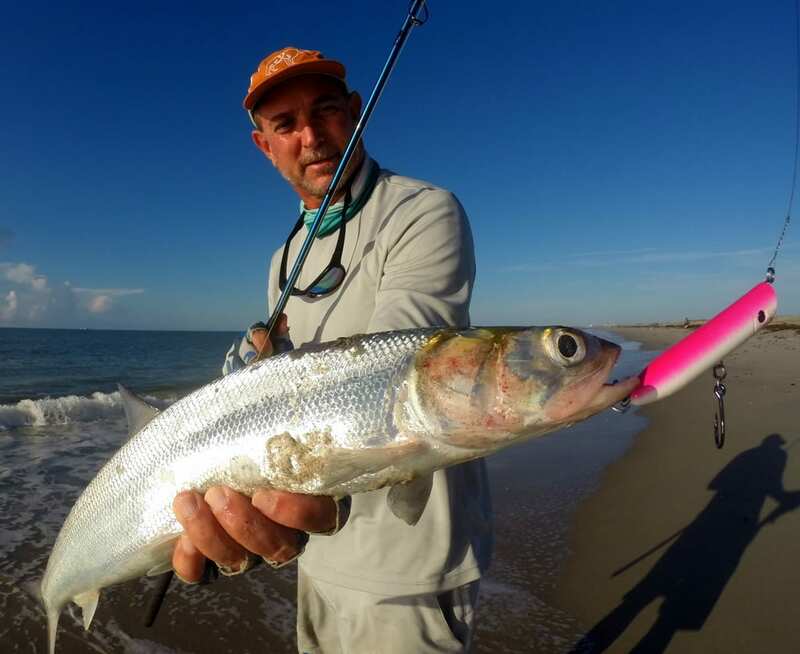 The great thing about the mullet run is gamefish are abundant and aggressive. Experiment and find the techniques that work best for you.